I've become very intrigued by art theft. While listening to the podcast Last Seen, a close examination of the still-unsolved theft at the Isabella Stewart Gardner Museum, I had a lot of questions about who steals art and where it goes. So for Christmas I asked for a book on the topic. My husband being who he is, he bought me not one but three books on the topic. The first one I started to read is the one he warned me was probably awful. It was also the most difficult to get. It was Hot Art, Cold Cash by Michel van Rijn, a dealer who got his start selling antiquities looted from politically turbulent countries. It would have been an interesting story had someone else written it, but this guy was a pompous braggart who mostly wanted to brag about all the women he slept with and I wasn't even sure how much of his sensationalist story to believe. I made it through 100 pages or so of the more than 400-page book before giving up. I knew the other two would be better. 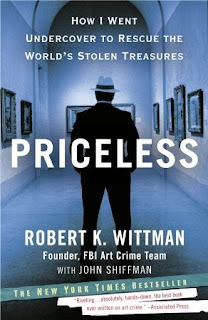 Priceless is written by a retired undercover agent from the FBI's Art Crime Team, and he had actually appeared on Last Seen so I was already a bit familiar with some of his story. He begins at the beginning, his mixed-race heritage and the prejudice he faced growing up half-Japanese, his entry into the FBI, his growing interest in art. The heart of the story, of course, is his work. Wittman learned a lot about art to prepare for his specialty, but he had a natural talent for dealing with people that made him a successful undercover agent. He was one of the first FBI agents who focused on art crime, and because of the nature of the work his goals were sometimes counter to that of the Bureau as a whole. He did want to see the thieves punished for their actions, but his most important goal was always recovering the art. He recovered paintings from artists as famous as Rembrandt and Normal Rockwell, but also irreplaceable items like an original copy of the Bill of Rights and a Civil War battle flag from one of the first units of black soldiers who fought for the Union. These stories were fascinating, and I can't imagine how thrilling it must be to get hold of such an important piece of history that has been missing and could have easily gone missing forever. I learned some surprising things, like the fact that European countries have huge art crime teams but that we had almost like it in the U.S. until Wittman made it his focus. Stolen art and antiquities have apparently not been a priority here. Most of the surprises are related to the Gardner case, and surprising because I just listened to a multi-part podcast that delved quite deeply so I thought I knew practically everything there was to know about it (that the public can know anyhow.) But from Wittman's account it really sounds like the case was bungled by the Boston FBI - the podcast touched upon complications relating to the Boston team not being willing to relinquish their hold. But according to Wittman they really didn't know how to handle people involved with stolen art and wouldn't let him use his expertise to its full potential and it has cost us. (It also caused him a huge career-related headache.) There was a whole operation in 2006-2007 based on a really strong lead and from the podcast it sounded like nobody knows if those people ever had the paintings, but Wittman's account makes it sound like they probably did but the FBI blew their chance of getting them. It makes me want to go back and listen to a couple of episodes of the podcast. This memoir was fascinating and I learned a lot, but still want to learn more. The third and final book in my art crime Christmas haul is the art-adjacent The Map Thief by Michael Blanding. It'll probably be a while before I get to it because of other reading I have lined up, but I'm looking forward to it!